Briton Rivière RA 1890-1940 British artist of Huguenot decent, Rivière was the son of William Rivière art teacher at Cheltenham College and latterly art teacher at The university of Oxford. Briton Rivière was himself educated at Cheltenham College and Oxford, where he took his degree in 1867. His first pictures appeared at the British Institution , and in 1857 he exhibited three works at the Royal Academy, In 1887 he was elected Associate of the Royal Academy of Arts and RA in 1881. 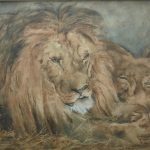 He is particularly renowned for works depicting animal subjects.